This issue of the Advanced Packaging Update presents the current state of outsourced semiconductor assembly and test (OSAT) financials. The latest trends in high-performance computing are discussed with a focus on developments in artificial intelligence packaging and assembly. An update on activities in through silicon vias (TSVs) and developments in direct bonding are discussed. A special section examines the growing market for micro LEDs. 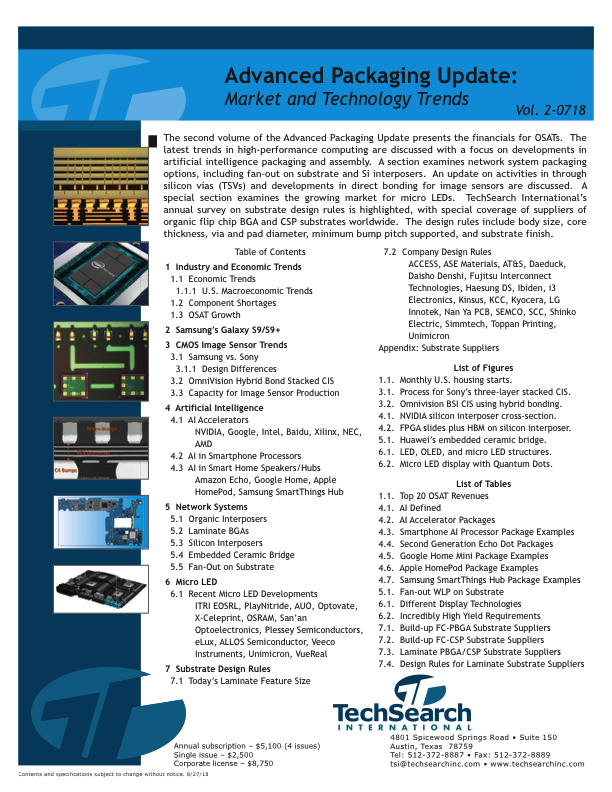 TechSearch International’s annual survey on substrate design rules is highlighted, with special coverage of suppliers of organic flip chip BGA and CSP substrates worldwide. The design rules include body size, core thickness, via and pad diameter, minimum bump pitch supported, and substrate finish. 3.1 Process flow for Sony's three-layer stacked CIS. 3.2 OmniVision BSI CIS using hybrid bonding stacking. 4.1 NVIDIA silicon interposer package cross-section. 4.2 FPGA slides plus HBM on silicon interposer. 5.1 Huawei's embedded ceramic bridge. 6.1 LED, OLED, and micro LED structures. 6.2 Micro LED display with Quantum Dots.